Start searching 470 homes in St. Ives now! St. Ives is well known for being one of the most beautiful areas in Cornwall, one of the most beautiful counties in the UK. 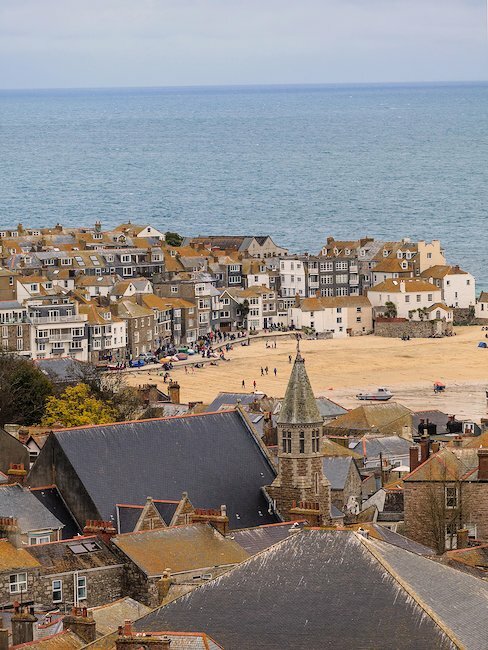 With many surrounding beautiful beaches, cosy cottages, and a great harbour, St. Ives is a truly picture postcard setting – discover yourself here with the assistance of Holidu's user friendly search function to find your dream accommodation! with a choice of many different beaches, not just in St. Ives, but also in the surrounding area, this part of the world ensures a memorable beach holiday with the family is experienced. Furthermore, the town was voted as The Best Seaside Town for 2010 and 2011 by the British Travel Awards – with its wonderful beaches and near Caribbean blue seas and skies, this comes as no surprise. Book a cosy cottage or a great holiday letting to discover your own St. Ives! also caters for great walks around its bays with the family. Discover St. Ives by foot and explore St. Ives' harbour, Smeaton's Pier and the the fascinating Cornish coastline – why not bring your dog along too! St. Ives caters for pet friendly holidays with its picturesque beaches and vast surrounding meadows. Pets will feel alive with a liberating landscape and dog friendly accommodations available with Holidu. 1. Art enthusiasts will be pleased to hear that St. Ives offers a Tate art gallery as well as the Barbara Hepworth Museum and the Sculpture Garden – Discover the Tate gallery by Porthmeor beach for a culturally enriching time after an active day out on the beach – with many child friendly facilities available, why not take the children too! 2. Discover one of St. Ives' longest beaches: Porthmeor Beach! This beautifully long and sandy beach is perfect for water sports, Take part in or enjoy surfing the active waves, build a sandcastle, play a game of catch or enjoy some beach volleyball: With clear blue seas in the height of summer surrounded by beautiful lush green hills, discover yourself here with a cosy cottage nearby! 3. Explore some fantastic wildlife which Cornwall has to offer and discover the so-called, “Seal Island.” Unsurprisingly, the tiny island is home to many Atlantic Grey Seals, a fascinating sight to behold. With Boat tours leaving to discover the island from St. Ives on a regular basis, this is a unique opportunity to take within the UK! 4. Come rain or shine, St Ives provides holiday makers with many varied activities to keep spirits high. If the sun doesn't seem to be shining on one afternoon, take the family down to the St. Ives Museum! Learn about St Ives' intriguing legacy – discover the town's history and view fascinating sculptures to get a feel for St Ives from a local perspective. 5. As well as Porthmeor Beach, St. Ives offers the stunning Porthminster Beach. This beach is in line with St. Ives' other beaches with its soft sandy surface and many activities to do. Discover this beach with the family! St. Ives: The jewel of the Cornish coastline with its renowned numerous beaches and beautiful surroundings. St. Ives is one of the most sought after destinations within the UK with good reason – holiday makers flock here to soak up the famous Cornish sun and experience its mild winters. Surfers are drawn by the town's fantastic water sports facilities as well as its picturesque surrounding landscapes and the Celtic Sea. Discover Cornwall's gem for yourself by choosing your dream St. Ives cottage or holiday letting with the assistance of Holidu's simple search function! Select pet and child friendly facilities if needed, additional facilities such as the availability of internet access, a TV, a garden, the amount of rooms required and many more. Book your dream accommodation online today with Holidu!